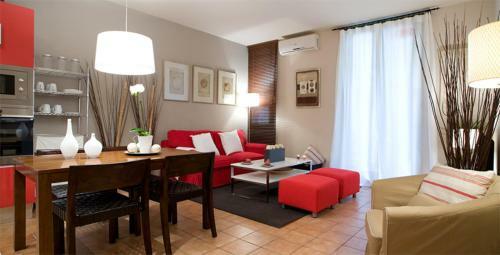 This modern air-conditioned apartment has a double bedroom and a bathroom with a shower. The living room includes a flat-screen TV with DVD player and a sofa bed. An oven, dishwasher and washing machine are provided in the kitchen. This modern air-conditioned apartment has a twin bedroom, a bedroom with a bunk bed and a bathroom with a shower. The living room includes a flat-screen TV with DVD player and a sofa bed. An oven, dishwasher and washing machine are provided in the kitchen. There is also a city-view balcony.